I tell you, sometimes after 10 hours in the car driving and teaching I get this total Jabba the Hutt feeling. I feel well slobby and lazy. The mind is tired after a long day but the body has done nothing at all. It's good to get some exercise if you have a driving type job. Being sat in a seat for hours on end is not the best thing for a body. I find it can lead to back ache, weight gain and a general lethargy. There are definite safety benefits in getting some exercise as well. When you run or whatever it is you'd prefer to do the blood is oxygenated and pumped all around and up to your brain. This will lead to greater alertness and powers of concentration. Just right for driving through those busy town centres. 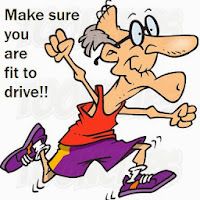 Fatigue can be a problem when driving for long periods and vigorous physical activity can help keep this to a minimum. Your physical reactions will be quicker giving you a much shorter stopping distance should an emergency situation occur. Having a good stretch on the gym ball helps keep away those lower back aches and pains. These can be distracting and hinder your physical movement. So get out there and get some exercise. it will make you a better driver. That's a promise. Where can I train for the Diamond Special driving test in Nottingham?